Find Hollywood Casino Bangor deals, discounts and special offers. The hotel is located next to downtown, and a short drive from Bar Harbor and Acadia National Park. This non smoking hotel is connected to the Bangor International Airport through a skywalk. 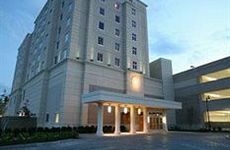 Situated steps away from many area corporations, the hotel features a salt water pool, a spa, and a fitness center. The hotel provides a smoke free environment, as well as easy access to the airport, and the American Cruise Lines.